Erin is one smart cookie, but can she keep the holiday spirit—and herself—alive til Christmas? In Jewel Bay, Montana’s Christmas Village, all is merry and bright. At Murphy’s Mercantile, aka the Merc, manager Erin Murphy is ringing in the holiday season with food, drink, and a new friend: Merrily Thornton. A local girl gone wrong, Merrily’s turned her life around. But her parents have publicly shunned her, and they nurse a bitterness that chills Erin. Leslie, what’s the story behind the title of your book? 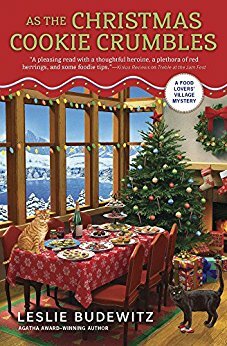 Each book in the Food Lovers’ Village Mysteries involves a festival–we do love our festivals in western Montana–and the recipes to recreate the festival food at home. The titles all refer to the festivities and hint at the food. Not hard to tell what we’re celebrating and eating in As the Christmas Cookie Crumbles! Cookie is the fifth book in the series. Each book stands alone, but I do suggest reading them in order to enjoy the character development, and because while each book has its own mystery, there is an additional mystery that runs through the first three books. I am a Montana girl through and through, though I went to college in Seattle and practiced law there for several years before moving back to Montana. Erin Murphy, the main character in the Food Lovers’ Village books, made a similar journey, and I’m enjoying exploring the experience through the eyes of a younger woman. We live in the woods outside a village very much like the one I write about. The best part is that intersection of community and the natural world. Once a lawyer, always a lawyer! I still practice part-time, doing civil litigation and mediation. Mr. Right and I met on a blind date. My parents had met on a blind date, and as a friend says, “It’s only dinner, and you might like someone.” By the end of the evening, I knew he was going to be a very important person in my life. He points out that it’s always tricky for a guy at the end of a first date to figure out what to say about getting together again and says it was great that in the parking lot, I put my hand on his chest and said, “You know I want to see you again.” That was 19 happy years ago. Right here, although I’d like the bathroom remodel project to be finished! Jewel Bay is closely based on the town where I live, a town that calls itself “Montana’s Christmas Village.” Visitors are always taken by surprise, particularly at the holidays, when every pillar and post is dressed up for the season. Since each book features a festival, I really wanted to recreate the local Christmas festivities on the page, so the book starts on what we call Decorating Day and ends on Christmas Eve. Years ago, when I lived in another small Montana town, the secretary at the small law firm where I worked was convicted of embezzling a large amount of money. It was her second offense–the lawyer who owned the firm knew she’d had stolen from a previous employer years ago during a difficult period and wanted to give her a second chance. After the theft was discovered–quite by accident–her parents shunned her, evicting her from her home, which they owned, and left town. I knew the family, and was never sure which was worse: her theft, or her parents’ reaction. Not long after, the credit union branch manager was accused of embezzlement and staged her own disappearance, although she was quickly found. I had an account there and had seen and chatted with her frequently for years. I discovered that embezzlers often follow the pattern that both these women fit, and I wanted to dive into it further on the page. Readers often ask me this, especially if they’ve been to the real-life village that inspired Jewel Bay. Mostly, the answer is no. I may have someone I know in mind–their job, their walk, a story they told me–as I start to create a character, but they evolve so much as the story unfolds that no one would ever recognize them on the page. An exception: The woman who owned the local liquor store for many years bought character naming rights for a Food Lovers’ Village book at a local charity auction. She’s the perfect cozy character, from her community involvement to her rhinestone-studded reading glasses, that I had to keep her pretty much as she is. And she loves it! Like Erin, the main character in the Food Lovers’ Village Mysteries, I grew up in Montana, left, and returned. I’m enjoying exploring that theme, a common one, through the experiences of a younger woman. Like her, I’m obsessed with food and enjoy cooking and entertaining. Erin shares my habit of spouting odd lines of poetry or from a play, my love of cats and cookies, and my commitment to my community. Although her mother Fresca and I aren’t much alike, I suspect that if I met Erin, she would feel like a daughter to me. You could ask me this five days in a row and get five different answers, but a few of the authors I turn to again and again include Louise Penny, Jacqueline Winspear, Toni Morrison, Laura Lippman, and the late Ivan Doig. In the last few months, I’ve also loved books by Anita Shreve, Rhys Bowen, Deborah Crombie, Cleo Coyle, and Catriona McPherson. Uh-oh–looks like I need to add some male authors to the mix. Oh, here’s one: Jamie Ford. I’m reading The Glass Room by Ann Cleeves, a Vera Stanhope mystery, in paperback. Vera is such a great character, and Brenda Blethyn’s portrayal of her in the BBC TV series is amazingly true to Cleeves’ creation on the page. I’m also listening to The Grave is a Fine and Private Place, the latest Flavia DeLuce mystery by Alan C. Bradley. Listening is very different from reading, but Jayne Entwhistle creates such an appealing character that I wouldn’t want to experience the books any other way. And the nonfiction book of the moment is Montana 1889 by Ken Egan, Jr., a fascinating look at the year of statehood. After 34 years as a lawyer, business hours are pretty well ingrained. I’m usually “on the page” by 8:30, with a lunch break to read news or articles on writing, then back at it for the afternoon. During the afternoon, I might write or work on promotion. I’ve got a lovely home office that always makes me happy! “I stayed up too late because of you.” But as every author will tell you, I am also deeply moved by the notes from readers who tell me my books helped them through a difficult time–chemo, sitting with a sick child or dying parent, depression or divorce. Because while I write to explore some aspect of human experience, I also write to entertain. I’m deep into the revisions of Chai Another Day, the 4th Spice Shop Mystery, to be published in May 2019 by Seventh Street Books. As owner of the Spice Shop in Seattle’s famed Pike Place Market, Pepper Reece is always on the go. Between conjuring up new spice blends and serving iced spice tea to customers looking to beat the unusual summer heat, she finally takes a break for a massage. But the zen moment is shattered when she overhears an argument in her friend Aimee’s vintage home decor shop that ends in murder. Leslie Budewitz blends her passion for food, great mysteries, and the Northwest in the Seattle Spice Shop Mysteries and the Food Lovers’ Village Mysteries, set in Jewel Bay, Montana. 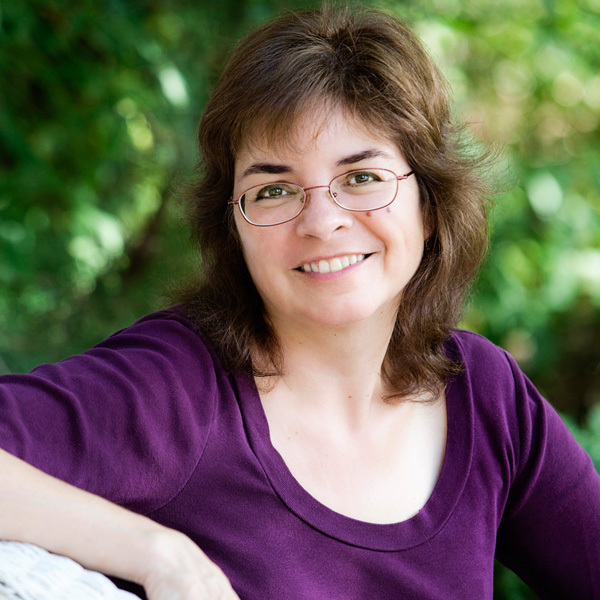 The 2015-16 president of Sisters in Crime and first author to win Agatha Awards for both fiction and nonfiction, she lives and cooks in North West Montana. Thanks for hosting me today, Amy -- fun interview! I always love Christmas mysteries. I would love to read this one. Thanks for the chance to win! This sounds like a great holiday read. Looking forward to some new Christmas cookie recipes for the holidays.